It’s Super Bowl Sunday (well, technically Monday as of posting), and I had a unique opportunity to attend Alternate Reality Games’ (“ARG’s”) Texas “Pokemon TCG State Championship” in Houston! Since the Super Bowl was actually IN the city of Houston on the very same day, it was quite a trek for me to drive from my end of town to the event venue. However, I’ve been very intrigued by what ARG has to offer as a new source of organized play for Pokemon. Before I go too far into this report, let me preface that as of writing, I have no affiliation with ARG. My only financial incentives to write this article extend to ads and the glorious DONATE button…the latter of which I promise not to plug too often, but is definitely worth considering if you enjoyed the article! Anyways, I like the concept of alternate organized play (“OP”) because alternate options are healthy for the game’s growth. 1. First, and perhaps most importantly, Play! Pokemon is pretty much just Regionals and up now, so there's a huge gap in the season that needs to be filled for people who can't go to the 15-some locations. Alternate organized play means that locals whose seasons begin and end at League have an increased chance for something big and exciting to be accessible. 2. Second, actions taken in alternate OP can encourage the official OP to improve. I know a lot of players have voiced frustration about the length of Regional Championships, and can totally relate to that frustration. Most ARG events appear to have sidestepped this issue completely by having shorter preliminary rounds, and reserving the much longer best-two-of-three matches for top cut. 3. Alternate OP can be a lot more imaginative than main OP. Whereas a standard form of organized play always has to appeal to more standard sensibilities, alternate OP can create absurd situations such as “high-roller” entry fees of $100 and first place prizes as big or bigger than Regionals. If higher stakes aren’t your thing, alternate OP also opens up the possibility for new formats. Ever wanted to play a “draft World Championship” in a game which routinely disrespects and ignores draft? Maybe you’d like a respectable event for Legacy, the Pokemon Trading Card Game Online-exclusive format which to my knowledge has still not had a major tournament in real life? With dedicated business and groups groups like ARG, these dreams can become reality. 1st Place: Gold ARG State Chamionship Logo Medal, Champion Playmat, ARG Invitational Invite, ARG State Championship Lapel Pin, and current sealed Booster Packs. 2nd Place: Exclusive Top 8 Playmat, ARG Invitational Invite, ARG State Championship Lapel Pin, and current sealed Booster Packs. 3rd/4th Place: Exclusive Top 8 Playmat, ARG Invitational Invite, ARG State Championship Lapel Pin, and current sealed Booster Packs. 5th-8th Place: Exclusive Top 8 Playmat, ARG Invitational Invite, ARG State Championship Lapel Pin, and current sealed Boosters. Prizing – For our attendance, first place got a box and a trophy. That actually isn’t so bad, and neither is second, but everyone third and below really didn’t get that much. For alternate OP like this, it’s awkward trying to balance the prizes, since small outfits like ARG don’t have nearly the resources and soft benefits that Nintendo or The Pokemon Company International does. What costs Play! Pokemon not much more than production and shipping to dole out as prizes costs companies no less than $60 or $70 to appropriate. Top eight also got some cool mats pins, and a medal. I’m not sure what of this stuff is actually desirable to the players, but I’m sure these exist primarily to promote the ARG brand. Personally I would’ve been happy with cash or more packs where possible, but it is what it is. Invitational Invites – Apparently there is an “ARG Invitational” happening from August 11th-13th of this year in Oaks, Pennsylvania. Since Pokemon TCG Worlds is held in August each year, there is a virtual if not absolute scheduling conflict, meaning many of the best competitors in the ARG circuit won’t even show up if they wanted to. This might be due to ARG wanting to run Pokemon alongside all of their other events, meaning that Pokemon’s inaugural first year won’t cost so much for them. However, the ARG invitational gives players without a worlds invite something competitive and exciting to do that weekend, which is always good for the game! As an advertising award meant to add “value” to these qualifier events, however, I’m not sure if they do much. All I can say is that it’s a good thing ARG posts the invite list online, because there’s a high chance I’ll lose this advertisement I got. $25 entry – okay, hold the phone…that’s REALLY expensive! I’m not sure how much it costs to make all those play mats, and who’s footing the bill for the ARG “kit,” but on paper, that’s a mediocre minimum payout. To be fair, the great store which actually ran this event opted to increase everyone’s pack payout considerably. However, I can’t help but think that if a more generous pack distribution was advertised by both ARG and the store, then attendance would have gone up. The idea here is to counter as much of the metagame all at once. You have Zygarde for Darkrai EX; Giratina EX for Vespiquen; Spinda for Gyarados; Garbodor for Volcanion and Greninja; careful Faded Town shenanigans against Mewtwo and Gardevoir; and then a whole host of attrition strategies involving your attackers for other matchups. To handle the latest onslaught of Volcanion lists running Pokemon Catcher, I opted for a 3-2 Garbodor line and a Super Rod, ensuring that I can have as many as four Garbodor out in a single game. However, as effective as this deck turned out to be in the few games of testing I played, I lost interest when accepting that I’d rather not end up in a situation where I burned my $25 entry fee in a local tournament for no payoff! And that’s actually an interesting point I’d like to study at some point: the impact an entry fee or other softer expenses have on deck choice. In the end, I went with trusty Yveltal. I’ve been using it since it first came out, and it’s single-handedly earned me almost all of my Championship Points from both this season and the last. So why not break it out one last time? If this list looks familiar, then you’ve probably seen something identical to what’s been played by Azul Garcia Griego, Jimmy Pendarivs, or Michael Pramawat to win their major events. The sole oddball inclusion is Lugia EX. It has the same HP, Resistance, and Weakness as Yveltal EX, and a slightly weaker first attack; however, its Deep Hurricane is incredibly useful. First, it offers me a way to reach higher damage ceilings that I can’t against low-energy threats, primarily Greninjas and Darkrai EX. Second, its secondary effect of discarding a Stadium gives me a tertiary way to rid the field of unfriendly Stadium cards. Other techs I’ve included to make the Lugia even more dangerous include Giovanni’s Scheme (+20 damage) or Absol ROS (moving three Damage Counters from a previously damaged Pokemon to a vulnerable active). I included neither, which worked against me in a metagame which would turn out to be so heavy in Darkrai, but the deck works just fine. Most of these ARG tournaments nationwide have been fairly small affairs, and this one was no different. Since this particular ARG had to compete with the Super Bowl, only 21 players total attended. Still, it was a good mix of people in the Houston area, as well as some people from Dallas – four hours away for those unfamiliar with the geography here in Texas. At this point I was thinking, “Man, I should have used my Zygarde garbage.” Too bad, so bad! When you run decks like Yveltal EX, you are hedging your bets against heavy fluctuations in the metagame. The plus side to always running decks like these is that you are rarely not in contention for winning the whole thing; the down side is that you can frequently find yourself in situations where you are the underdog against every single deck you play against. Obviously it didn’t pan out that way, but I look at this field and think I have a bad matchup against no fewer than 12 of these players. To that extent, I think any high finish was an overperformance on my part. So, how did I finish? Read on to find out! M Gardevoir is one of those matchups that should on paper be too brutally difficult for Yveltal to even hope to compete in, yet in practice is actually very winnable. It’s a very methodical process where you chip away at only their attackers with Yveltal Breakthrough, and then close out with a heavily loaded Yveltal EX or Lugia EX. Multiple things can go against you when doing this, particularly well-timed Lysandres or Hawlucha Steam Siege plays to get keep Fright Night from shutting off Gardevoir’s Spirit Links. I finished 5th overall in Standings, but because we were cutting to a top eight, I still had a chance to play for the win…not to mention more packs! He ran a mirror list with a much larger emphasis on Yveltal EX, and less on the non-EX attackers. This worked out in my favor, as the whole tempo of the match became favorable for me. In both games, I took great care to spreading as much damage on his side of the board as possible before committing to an Evil Ball or Aero Ball attacker. I also guessed correctly he ran at least one between Olympia (Switch and Heal 30) or Pokemon Center Lady (Heal 6), so I took as many chances as I could to add damage to his EXs beyond these multiples. It paid off big time, as I would frequently find myself in spots where my decision play a Fighting Fury Belt on Yveltal GEN allowed me to Oblivion Wing for an extra ten damage turn one on a Pokemon I guessed would be Olympia’d, only to pay off around turn 10 to win me the game. Both games more or less played out in this manner, though my Enhanced Hammers were of course huge in keeping his Yveltals under control. Game One – Despite being a completely different Darkrai player, my hand dealt out in a very similar manner to the one in Round Two. While my slow start this game was a bit better, repeated whiffs on Max Elixir coupled with not drawing into Energy pulled me further and further behind. I finally got an Yveltal EX into play and attacking, but it was quickly Knocked Out the next turn. Game Two – He made the best out of a relatively weak hand, using a combination of two Lysandres and two Escape Ropes to keep my Yveltal Breakthrough from destroying his Yveltal EX tech and Darkrai EX. However, I reversed fortunes this game by being able to set up two “Ball” attackers with little difficulty, and mowed through his EXs with little trouble. He did not get close to an OHKO this game! Game Three – My heart sinks to see my opening hand: Trubbish, three Max Elixir, a Float Stone, a Super Rod, and a Darkness! Although I top-decked a Professor Sycamore, I regrettably only drew into more unplayable garbage (pun intended), to the point where I had zero playable cards before benching my Shaymin EX! Meanwhile, Christian got out a turn two Darkrai EX dealing big damage, and I got benched by turn three. I’m not sure if he ended up winning; however, it was an all-Darkrai finals, meaning there’s little guess as to what won. Pictured above is what I got for finishing third. While I still definitely have some reservations about that $25 price tag, my day out in ARG-land was fun, and got me some packs of the latest set…of which I owned none until today. The store was smart to increase the prize pool across the board, and they were really great hosts. I’m looking forward to their upcoming League Challenges and League Cups, which as I understand should have a much better prize payout than ARG! Jimmy took the time to show us all a very interesting take on draft. This time, it's a live opening of packs/strategy on the picks. Considering how talkative most of us are, we didn't really develop a consensus on the optimal way to play the deck. 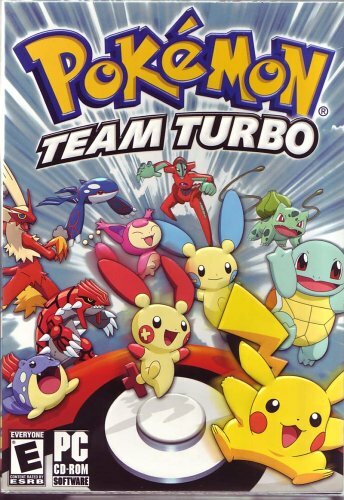 I suggested the turbo bild briefly, while Monster of the lake proposed that it should be run with a slim Machamp line. The overwhelming majority, though, said that Lostgar should not be played with Palkia. Nothing was addressed about turbo lists or Mew Prime, but Palkia was most heavily opposed to. Theoretically, Machamp's usage should rise due to less Vilegar and Gyarados, and more SP/Tyranitar (brought on by the greater Lostgar showing). However, one (i.e., "I") could argue that cities showed how mediocre this deck really was in the current format; it had several weak matchups, and even those that are believed to be "good" (SP) are surprisingly close. Plus, Lostgar might still be a horrid matchup. So all in all, the 'Champ is as hopeless as it's ever been. 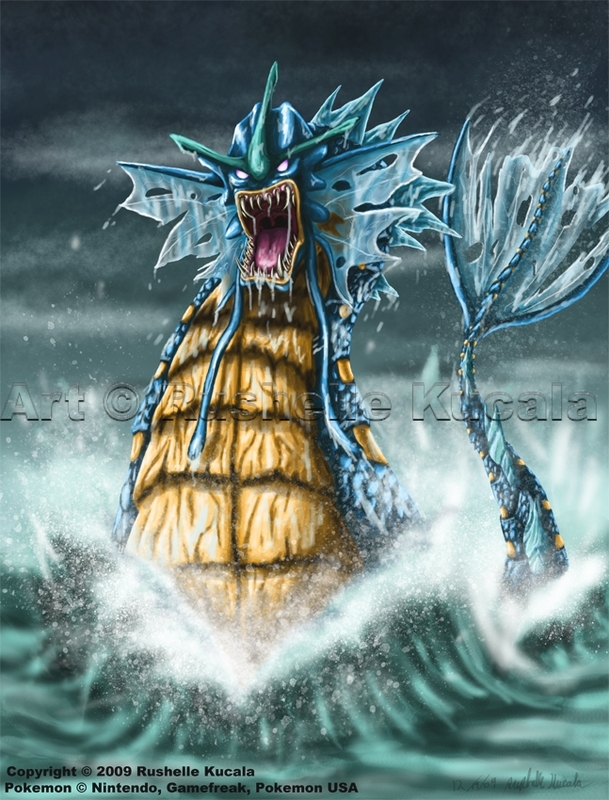 Inferred from the chat was the idea that Gyarados is hit hard by Call of Legends. Due to Lost Remover taking away Rescue Energies, Gengar Prime capable of Hurling away critical Magikarps and/or Gyaradoses, and a proliferation of good Luxchomp lists, Gyarados is hard-pressed to win. Still, MotL mentioned a bild featuring Old Amber, Mesprit, Seekers, and Cyclone as one that held great promise to beat down the generally dubious LostGar match. Ryan V. "ryanvergel" was quick to note that "…the most effective use of special energy is sniping with chomp." This in turn denies Lost Remover "its most important target." And as a result, it isn't as good as it could be. It is, however, good against Gyarados, Garchomp SV, Dialga, Steelix, and Tyranitar, and when combined, that makes up a potentially sizable portion of the field. What are the top three decks that constitute our current tier one? While I'm really not sure about Tyranitar being in the same league as any of these other decks, it is most certainly underrated. As for the other five, they definitely hold claim to "best in format." Speaking of…What IS the best deck in the format? Not many people felt brave enough to make claims, but those who did heartily said "Luxchomp." User Shadow Aurion also mentioned the following on Gengar: "…[it isn't] going to flop, but I don't think it's going to be as oppressively strong as some people predicted either." We don't know what the future has in store, but either way, it should be more interesting than Cities! Much in the spirit of my Palkia build is the third – and probably strongest – of the lists: the turbo build. This has been floating around for a while, and I know of several people who've advanced the techiness beyond this basic version; however, this should help get you started. Advantage/s: The list is obviously fast. Through Poke Drawer, Dex, Unown R's, and Junk Arm to bind them all together, pulling out a first or second turn Gengar Prime suddenly gets a lot easier. Although running only three Seeker seems suspect in a turbo list that requires Seeker to be played over and over again, Junk Arm helps alleviate this by means of VS Seeker, ultimately giving you a maximum of _nine_ uses. Disadvantage/s: with nineteen trainers and zero Bebe's, one could say that this deck is heavily vulnerable to Spiritomb Arceus locks. However, this shouldn't be too big of a problem, as the number one most popular Spiritomb deck, Vilegar, should be a very comfortable win for you. Pros: running Palkia helps correct your potential bench issues, and also gives you a contingency plan to Lost Zone things in case Gengar Prime isn't as fast as you'd like. *Running multiples of Spiritomb TM – a crucial card in netting yoru Hurl Into Darkness targets – is also a good plan in my opinion. Spiritomb Arceus also helps out a ton in this regard. Cons: …And on that note, I should mention that this list is fairly slow relative to some of the other ones I've seen floating around lately. You might want to fit some Rare Candies in, as suggested above. Also, you might encounter a couple issues with not running Gengar LV.X; however, running four Gengar Prime also makes it much easier to start Lost Zoning ASAP, so mess around with it. In my third and probably final Deck List Dump of LostGar, I'll be revealing my take on a turbo list (which is so far my favorite variant). Best of luck in testing for states, everybody! As I said, don't take my word alone, because this is just a starting point. 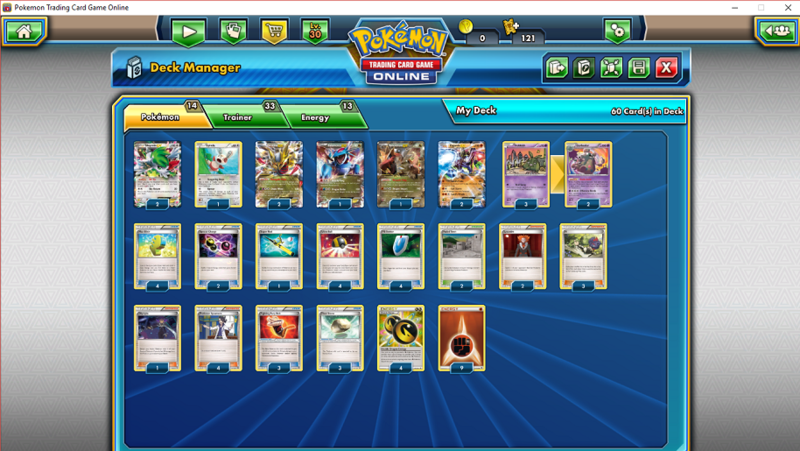 In a very special edition of "Deck List Dump," we here are HeyTrainer look to solve the condundrum of LostGar (Gengar Prime Triumphant/Lost World Call of Legends). If you check out the corresponding forum thread, you'll realize one thing, and that's that very few people have consensus on the deck! So, what to do about this little issue? Well, for the next few segments of Deck List Dump, I will be posting nothing BUT LostGar (the supposed new tier one deck), as well as my comments on the strengths and weaknesses of each variant. Today, we'll be examining the first known variant of any success: Gengar Prime/Mew Prime, which has seen a ton of play in Japan. Now, the biggest question that should be on your mind is, "why do we have no standard on how to build this deck yet?" Simple: the successful lists in Japan all had Claydol (Great Encounters) and Roseanne's Research (Secret Wonders) accessible to them. With Claydol, consistency was guaranteed against even the dreaded SP, and with Roseanne, you could be relatively sure that you had access to much-needed energy. Unfortunately, though, those two great cards have been rotated out of our modified format. With neither of those, we arrive at a bit of a conundrum on how to make it the best deck we can. The strategy is pretty basic: ideally start with Mew Prime, See Off a Gengar Prime, and by the second turn, you should be able to Lost Link Hurl Into Darkness, which – in time – should get you your much-desired Lost World win condition. *Mr. Mime is for revealing your opponents hand, so you can optimize your chances of success for Hurl. *Spiritomb Tirumphant is to force them into more Pokemon for Hurl targets. The reason why we don't run Giratina is because it draws LESS, and because THEY choose how much they draw! *Mesprit is to help maintain a long, reliable Trainer lock. Thanks to Junk Arm, VS Seeker, and Seeker, you can use this power up to ten times in a single game. *Seeker not only picks up your Mesprits/damaged guys, but also forces a Pokemon from the opponent's bench to his/her hand. As a result, you'll usually have some sort of Hurl target, thus making this card a must-of in every Lostgar variant. ***Strengths: since Mew Prime is a basic, it's much easier to setup, and as a result, allows you the chance to very quickly start Hurling from the second turn-onward, and perhaps for more than one Pokemon! ***Weaknesses: a big problem with this variant is that, without the aforementioned cards, it ends up becoming much more brittle. Furthermore, you have a lot of easily-KO'd, low-HP Basics to rely on, which allows for even more vulnerability to the super-speedy SP variants of this format. The list may be imperfect, and may be far from tested, but it should be a pretty reasonable starting point for anyone interested in LostGar For the next edition of Deck List Dump, I'll be posting a variant with Palkia G LV.X. Stay tuned, and be sure to tell your friends about /blog! 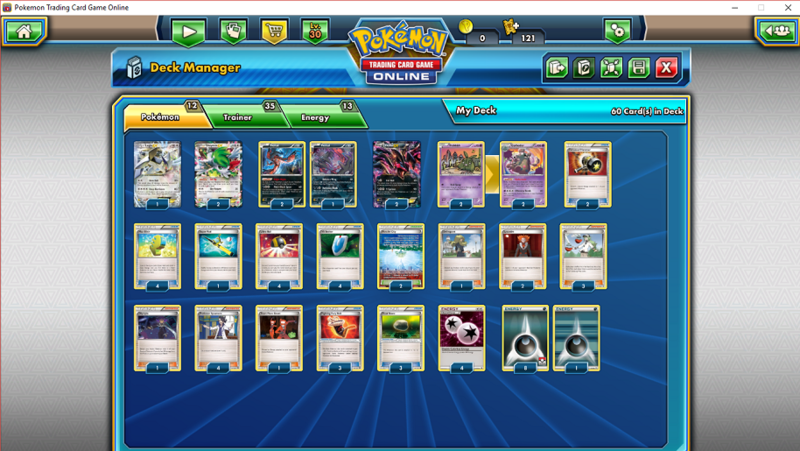 I have also sought out Austin B/Austino (Gyarados pro and author of the previous "retro" post),and he is interested in writing a response article, discussing his radically different philosophy on the deck. So that takes us through all the card choices used in the sample list. But what are some other options for a Gyarados deck to play? *Luxray GL Lv X – Bright Look can be a very powerful tool in Gyarados decks, allowing you to take easy prizes and/or disruptive KO’s. Due to Gyarados’s high retreat cost, you’ll usually only level up after a Warp Energy, or after a KO. It’s a strong card in the Gyarados mirror match where it allows you to take easy prizes rather than hitting an opposing Gyarados (which will most likely be healed). Gusting is very good against SP in general, especially Luxchomp, although Luxray is a big Power Spray target, especially as Bright Look can’t be used twice in one turn (unless you’re running a 2-1 or 2-2 line, which would be very unusual). *Dialga G Lv X – A card that is only really useful against Vileplume decks, mostly Gengar/Vileplume. Time Crystal shuts off Vileplume (and to a lesser extent, Spiritomb as well) which allows you to play all of your trainer cards again. Unfortunately, it is a Level Down Target, so it’s not that easy to simply use Warp Energy to get it to the bench and have it sitting there the whole game. Usually, you will level it up, play all the trainers you need, then Poke Turn it back to your hand, and bench Dialga G again, and rinse and repeat when necessary. This helps because it allows you to play all of your trainer cards which can be useful for anything from healing (SSU) to extra damage (Poke Turn) to search cards (Luxury Ball), but it also allows you to reduce your trainer count for Poltergeist. Despite Vileplume being the main reason for Dialga G Lv X being a possible tech, it can also shut off Poke-Bodies such as mew prime's Lost Link, effectively crushing Mewperior decks and Time Crystal can also shut off Scizor Prime's Poke-Body too. But as a general rule, Vileplume would be the main reason for Dialga G Lv X's inclusion. *Ditto LA – Ditto is a very specific tech: it gives Gyarados a much stronger mirror match-up because its Poke-body, Ditto DNA, allows you to have 4 Magikarp in the discard pile and copy the opposing Gyarados’s Tail Revenge for 120 damage, scoring easier KOs. Ditto even keeps the active Pokemon’s HP, can use Rescue Energy ,and be recovered by Pokemon Rescue and Combee just like Magikarp, which means Ditto alone can OHKO several Gyarados. If you are going to play Ditto, watch out for your opponent triple-Flash Biting your Ditto, then sending up a Magikarp or Unown Q, meaning Ditto has 30 HP and is KO’d. *Blissey Prime HS – While not particularly popular, or an outright amazing/match-up winning tech, Blissey Prime can be a very useful in giving you a free heal on Gyarados, as well as any other Pokemon that may have been damaged (which generally isn’t too useful). A nice bonus is that you can Seeker up Blissey instead of having to find a Warp Energy/Warp Point to get Gyarados to the bench to heal; the downside, though, is that Blissey can be Psychic Binded, and any Rescue Energy on Gyarados will be discarded if you want to heal, so make sure you play intelligently. Another less obvious use for Blissey prime is to act as a sponge for Warp Point (and similar powers like Infernape 4 Lv X’s Intimidating Roar). While Gyarados has great HP, the deck usually has a bench littered with low HP Pokemon, and as such, Blissey Prime is good against the mirror match, where Warp Points are very strong cards as they usually allow an OHKO on a weaker benched Pokemon. *Uxie Lv X LA – A card that can be fit in relatively easily, Uxie Lv X helps give the deck additional drawmid-to-late game. While not absolutely necessary, Uxie Lv X can give Gyarados a slight card advantage which can win close games, especially match-ups like the mirror where it’s a real war of attrition. *Pokemon Reversal – While flippy, Pokemon Reversal can win games by getting easy and/or disruptive prizes. It is especially strong in Gyarados’s Luxchomp match-up because it allows Gyarados to either OHKO Lucario GL, which may mean that Luxray GL Lv. X can never OHKO a Gyarados. It also allows the Gyarados player to KO a benched Luxray GL that the Luxchomp player may be building up . All in all, this Junk Arm-able card, if well-timed, can pave the way for amazing comebacks. *Poke Blower + – In a similar vein to Pokemon Reversal, Poke Blower + allows you to gust up a benched Pokemon of your opponent’s, but instead of a single flip, you need 2 Poke Blower for a guarantee. On average, this makes it slightly weaker, but the guarantee helps somewhat, as Junk Arm makes it easier to re-use. Another good effect of Poke Blower is that you can play just 1 down, and, on a flip, get the equivalent of a Flash Bite. If you’re 10 shy of a KO, this can be a nice bonus. So which one to play? In my opinion, if you have 4 slots to devote to either card, Poke Blower + is better, but any less and Pokemon Reversal becomes the superior option, simply because you need 2 Poke Blower + at a time to get full usage out of it. 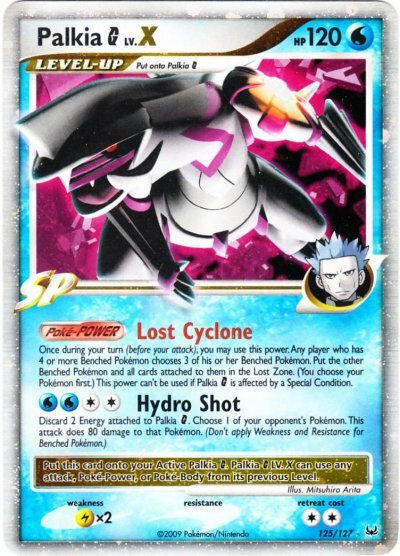 *Skunktank G PL – Skunktank G is, in my opinion, a very underrated and underused tech in Gyarados. It can act as an extra 10 damage, but also allows you bypass the effects of Fainting Spell and Rescue Energy relatively easily. It’s not hard to get around poisoning yourself either, with Warp Energy, or using it after a KO (when you promote a Pokemon, poison, then retreat) or use it after SSU’s Gyarados. Solid card, better for lists with 4 BTS though. *Volkner’s Philosophy – Volkner’s is probably the most popular draw Supporter in Gyarados decks, due to its ability to discard Magikarps as well as draw cards. In terms of its raw drawpower strength, it is generally inferior to cards like Copycat but the fact that it can also discard Magikarps (especially through Impersonate) makes it a very legitimate option to even run 2 or more of in your deck. *Cynthia’s Feelings – Yet another draw Supporter, Cynthia’s is obviously best used after a KO. While a good card, often Gyarados decks can “tank’ and heal and can go several turns without giving up a KO (especially in the mirror match) which means Cynthia might have to wait to be played until a Pokemon of yours does get KO’d, which can make it slightly inferior to other options. *Judge – Generally a one-of card, it can be a nice disruption card that your opponent will rarely expect. Judge can also hurt your own set-up, so make sure the odds are in your favor of recovering better than your opponent. *Looker’s Investigation – Similar to Judge, with more flexibility. Since you can either shuffle in yours or your opponents, and get to see your opponent’s hand before doing so, it’s usually the better card and is not as prone to backfiring like Judge is. *Twins – Yet another one-of Supporter, Twins is particularly useful for searching specific, otherwise-unsearchable cards out of your deck. It is not suggested to run Twins in lists that also run Poke Drawer +. *Black Belt – In a similar vein to Twins, Black Belt is usually a 1-of card in Gyarados and can only be used when behind on prizes. Fortunately, Black belt’s strong effect makes up for it. An extra 40 damage can mean unexpected OHKO’s on Pokemon like Expert Belted Luxray GL Lv X’s (an issue for Gyarados decks due to them being difficult to KO) and opposing Gyarados’, especially Belted ones. If I have missed any techs that you have played or seen played and you think warrant a spot in Gyarados lists, please let me know. *Luxchomp: The most successful deck for City Championships, Luxchomp is a very close match-up for Gyarados. Usually, Luxchomp will get a prize or two ahead, but Gyarados is very capable of coming back. A Tail Revenge for 90 is 20 off KO’ing a Luxray GL Lv X and Garchomp C Lv X, so either two Crobat G’s or Expert Belt allows you to OHKO. Luxchomps will usually try to take the first KO with Garchomp c Lv X, preferring to save their Luxray GL Lv X’s for mid-to-late game. From there on, the match-up becomes a trade in prizes and resources. Make sure you can always recover Gyarados and always attempt to get a prize a turn. It can get tricky, but like all match-ups, this is an especially important one to think a few turns ahead. Mesprit helps enormously against Luxchomp: an Expert Belted Gyarados, along with Psychic Bind, makes it impossible for your opponent’s Luxray GL Lv X to OHKO your Gyarados, and can be re-used with SSU and Seeker (Mesprit getting Sprayed is also an issue – stock up on those SSU/Seeker/Junk Arms). This can turn the tables around and can win a close game. Your opponent will try to use Dragon Rush for an easy prize on turns that they are Psychic Binded. Another thing to watch out for is the Expert Belted Luxray GL Lv X. This can be very difficult to OHKO and can OHKO Gyarados’ regardless of Psychic Bind. Most lists don’t run Expert Belt, and even then it can be hard to get out for your opponent, but if you ever find yourself staring down an Expert Belted Luxray GL Lv X, it can be difficult. OHKO’ing it is obviously the first priority but sometimes that can’t be done, especially if your opponent has stocked up on Power Sprays. Depending on the prize count, it’s possible to use Regi Move and/or Warp Point to take easier KO’s around it but that doesn’t work if you’re behind in prizes. If you know your opponent runs Expert Belt and especially if you forsee them being able to Belt a Luxray X, try to stockpile ways to re-use Flash Bite in your hand, along with Expert Belt, to OHKO it. Gusting cards like Pokemon Reversal, should you run them, help a lot in this match-up as well. Just make sure you use your resources wisely and probability is your friend here (as it is in Pokemon in general). *Gengar/Vileplume: Vileplume is an absolute pain for any Gyarados deck because it prevents crucial trainer cards from being played like Luxury Ball, Super Scoop Up, Pokemon Rescue, etc. Gyarados is a faster deck than Genplume is, even under an early trainer lock, so generally Gyarados will get the first 1-2 prizes, then will start having to deal with Gengars. Fainting Spell is difficult to get around. It’s possible to hit for 90, then Flash Bite twice (either with two Crobat G’s or 1 Crobat G and a Seeker) but this can be prevented by a timely Level Up into a Gengar Lv X, messing with the damage calculations. Another possible option is to attach to an Uxie the turn you hit for 90 with Gyarados, so you can Warp Energy Gyarados to the bench and Psychic Restore Uxie under for the KO, avoiding Fainting Spell, but this is generally very hard to pull off. Because it’s difficult to avoid Fainting Spell, often you’ll have to go straight into it, meaning flips often determine the outcome of this match-up. In terms of what Gengar’s attacks can do to you, Poltergeist is a weapon and needs to immediately be kept in check by using Regice to discard any excess trainer cards from your hand (unless you’re playing Dialga G Lv X in which case you should save them so you can use them after a level Up. Even then though, discarding some trainers is often the correct play). Once you do this, Gengar will have trouble KO’ing Gyarados without Fainting Spell and will usually attempt to take its prizes by Shadow Rooming your bench. Luckily, all of the bench sitters with Poke-Powers have more than 60 HP, so against most lists they will have to Shadow Room a benched target twice to get a KO. Because of this, Seeker helps tremendously in denying prizes. Recovering Gyarados is difficult because Pokemon Rescue cannot be used under a trainer lock and Rescue Energy is often bypassed due to Fainting Spell KO’ing Gyarados. This is the match-up where you will use Combee and 2-3 of your Gyarados. Combee can be Seeker’d up as well to re-use Honey. This match-up depends a lot on techs, too. If the Gyarados player runs either Dialga G Lv X or Skunktank G they should tilt the match-up in their favor but otherwise it’s a very tight struggle with the slight favor going to the Gengar/Vileplume player. Not only Gyarados’ techs affect the game, but Gengar’s do as well. Any gusting tech like Zangoose or Froslass GL can bring up Regice, allowing the Gengar player to snipe around it and cause you real trouble if you can’t find a Warp Energy. Additionally, if the Gengar player plays Crobat G they can get OHKO’s with Shadow Room with relative ease, making the prize trade favorable to them (and every time you play a Seeker, they get to pick it back up to play it again for another OHKO on any 70 HP Pokemon with a Poke-power). These games will usually start off with Gyarados taking the first 1-2 prizes, then both decks two-shotting each other with Gyarados being able to Seeker to avoid some KO’s but the Gengar player picking up some extra ones with Fainting Spell. Any KO’s the Gyarados player gets by hitting for 90, then double Flash Biting also help tremendously. However, Gyarados has a slight issue in terms of recovery and can stall out for a turn or two while it needs to search out and recover Combee while also searching out another Gyarados (often done with the aid of Sableye). There’s also the issue of Gyarados being a lot stronger in matchplay games, which can give the deck a slight edge in topcut games due to Gengar/Vileplume’s slow speed. [HT EDIT – to elaborate on this point, keep in mind the rules in match play: if time+3 is called during game two, then whoever is ahead in prizes that game is declared its winner. What I interpret fffuuuu to be hinting at is a situation that pans out where, due to little fault of either player, Vilegar wins game one of a 2/3 match with little time on the clock left for game two. Gyarados then proceeds to establish a 1-2 prize lead, drags it past the “+3” turns, and brings the game into a sudden death, which he/she also wins due to its stellar match play. *Mirror: Obviously Gyarados isn't exempt from playing against itself in tournaments, which isn't unlikely due to its popularity. As for the match-up, it’s usually a slugfest, with one deck taking the early KO, then oftenm a few OHKO’s with Belted Tail Revenges here or there, but the game will usually go into a steady “Hit for 90, heal Gyarados, hit for 90, heal Gyarados” etc. phase. The more times you can OHKO your opponent (either with Flash Bites, Skunktank G, etc. ), the more times you can heal with SSU and Seeker, and the more times you can take cheap prizes (Warp Point, Reversal etc.) will almost certainly determine the winner. It’s not a particularly complicated: Mesprit can be an interesting card in the mirror to slow the opponent’s game early on by preventing Regi Move, Set Up and Time Walk and in theory you could get a good 2-3 prize lead by re-using Mesprit if your opponent’s hand isn’t strong enough. But as a general rule, this match-up doesn’t have too many complicated dynamics to it; it’s basically just a prize trade. *Dialga/Garchomp: Dialgachomp is generally an easier match-up than Luxchomp is: Dialga G Lv X cannot OHKO Gyarados 99% of the time, so you can Warp/Seeker or SSU the damage off usually. Regice plays an important role also, in switching out a tanked Dialga G Lv X that you may not be otherwise able to KO for an easier prize. Like Luxchomp, Dialgachomp will use Garchomp C Lv X to get easy Dragon Rush OHKO’s off your bench as well. Lists that run Skunktank G and Stadiums are generally harder to beat, as poison can bypass Rescue Energy and the Stadiums counter BTS. Without another BTS, you won’t be able to effectively heal or recover Gyarados and they can generally bypass Rescue Energy as well (or remove the energy with Remove Lost) so against lists that run Stadiums, try not to discard any excess BTS because each because nearly every copy is important. Gyarados lists with 4 Broken Time-Space will find it easier than ones with 3 in this match-up. If everything goes right for Gyarados, the prize trade works out in your favor. The main issue is if you get stuck without a BTS (which also means that even if you recover Magikarp, as soon as you play it down it will get Dragon Rushed). It’s a generally favorable match-up, but a good Dialgachomp player will often be able to exploit your mistakes, so play carefully. *Machamp: Machamp isn’t as popular as the aforementioned decks, which means it’s difficult to acknowledge a “universal’ list. All Machamp decks will run Machamp SF and will usually get 1-2 prizes ahead with Take Out, although, it’s possible for Gyarados to take the first prize as well. Due to Machamp’s heavy reliance on Uxie’s Set Up it’s possible to stall their set-up for consecutive turns while you start taking prizes. If you can OHKO Machamp SF, do so. They will generally follow up with Machamp Prime which is nearly impossible to OHKO, so it’s better to use your extra-damage resources OHKO’ing their early Machamp SF. Once their early SF Machamp goes down, most Machamp builds will try to get out two Machamp Primes and rotate between them with Fighting Tag while healing with Seeker. Fortunately for Gyarados, they are incredibly unlikely to ever score an OHKO on you, so both decks should 2HKO each other. Gyarados has more healing and can use Mesprit to prevent the Machamp player’s Fighting Tag, meaning unless they want to retreat it, it’s stuck active and will be KO’d. Another thing to consider is Gyarados is easier to recover than Machamp Prime (most Machamp decklists don’t play many recovery cards, either) so all of this means Gyarados is a strong favorite over Machamp, although builds vary and it’s difficult to pin down any specific list or strategy. Overall, Gyarados is a consistent, reasonably fast, high damaging deck with a lot of healing options and room to tech certain cards. It was the 2nd most successful deck for City Championships for good reason – It’s really good! So here ends the article! Thanks go to Jason and Johnathon for giving input on the article and for their extensive knowledge on the deck, as well as playtesting. 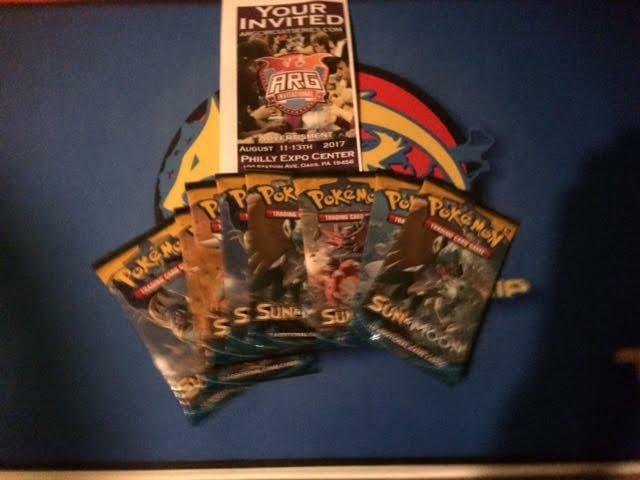 Thanks for reading and don’t be afraid to give Gyarados a shot at your next tournament! Happy testing everybody! At the turn of the new season, the format changed to Majestic Dawn-On, and Gyarados seemed to be nearly dead. With the loss of Felicity’s Drawing, the deck had a great trouble with consistency and speed. However, help was to come in the next set: Triumphant, which provided the deck with all the new tools that would give it success. Junk Arm, Seeker and Rescue Energy made Gyarados faster, more versatile and offered many healing and recovery options and with the start of City Championships the deck became top tier. With the relative speed, high damage output, high HP and gross amounts of ways the deck had to heal off damage, the deck thrived and, with the almost-complete data we have of CC wins, was the second most successful deck, behind Luxchomp. Throughout this article I will be explaining the deck’s fundamental strategy and key cards, providing advice on match-ups, and suggesting options for specific techs. No matter what your Gyarados list looks like, it will have the same fundamental strategy. The deck aims to discard 3 Magikarps and hit for a base damage of 90 with Gyarados’ Tail Revenge attack, all for no energy. How does it do that? By utilizing Junk Arms, Pokemon Collector, Regice, Sableye and Smeargle, the deck will usually start hitting for 90 on Turn 2-3. If it can get set up fast enough, doing 60 damage is also acceptable to KO opponent’s low-HP Basic Pokemon early on. What happens when your Gyarados gets damaged? Cards like Super Scoop Up (SSU) and the Warp Energy/Seeker combo are important ways to heal your Gyarados when it gets damaged. The specific counts of these cards vary from list to list – I’ve seen lists with no Seeker, and lists with no SSU. And it is up to you on what you play, and how many of each card you play, as these counts depend on personal preference and metagame. Either way, healing Gyarados is a fundamental aspect of the deck. But if you’ve got 3 Magikarp in the discard pile and one Gyarados in play, what happens when your Gyarados gets KO’d? There are 3 main ways to prevent or recover from this: Rescue Energy, Pokemon Rescue and Combee SF. These cards all allow you to at least recover your 4th Magikarp back, so you can play down a Broken Time-Space and evolve right back to Gyarados, and start hitting again, for no energy. While Gyarados is a deck that cannot swarm, it does have a speedy recovery system to compensate. 4 Magikarp SF – Magikarp has to be one of the worst basics in the game. With 30 HP and no particuarly strong attacks to make up for it, Magikarp is a Turn 1 win waiting to happen. Magikarp’s 30 HP is especially bad because if you don’t draw into a Broken Time-Space, you’ll need to play it down on the bench to evolve to Gyarados next turn, where it can be easily KO’d thanks to its low HP, either by Crobat G/Poke Turns or Bright Look. Mesprit can help with preventing your Magikarp KO’d this way in some situations, but always be careful. The Stormfront one is widely considered the best due to its Sea Spray attack. When you can’t retreat to a Sableye/Smeargle, or attack with Gyarados (which is almost always when you open with Magikarp going first, which happens to be the situation you’re most likely to get donked in), it can be decent to draw cards, which averages at a bit under 1 heads. Essentially though, Magikarps are just there to be discarded, although one will have to be used to evolve into a Gyarados. 3 Gyarados SF – The real powerhouse of the deck, Gyarados clocks in at a whopping 130 HP, which is amazing for a Stage 1 card. Gyarados’ high HP, along with Expert Belt allows the deck to “tank” with SSU’s and Warp Energy/Seeker. Tail Revenge is the only attack which is actually useable in a conventional Gyarados deck, but it is incredibly strong. For no energy, with 3 Magikarps in the discard pile, it can deal a base of 90 damage. With Regice and Junk Arms, Magikarps can be discarded with relative ease. However, since you’ll want 3 Magikarps in the discard pile to hit for maximum damage, and one under Gyarados, the 4th Magikarp will need to be recovered. Gyarados has a Lightning Weakness, which is probably one of the worst in the format due to the prominence of Luxray GL Lv X. However, it is only +30, so for Luxray GL to OHKO Gyarados, it will need a Lucario GL on the bench. Since Luxray GL is really the only popular card that exploits the Weakness, I’ll just talk more about it in the match-up section. Gyarados has a useful Fighting Resistance, which gives the deck a favorable Machamp match-up: Machamp SF will do negligible damage to Gyarados, and Machamp Prime will find it nearly impossible to OHKO a Gyarados in one hit, allowing you the chance to Seeker or SSU the damage off. Gyarados’s 3 Retreat cost is not ideal, and is the reason the deck plays Warp Energy, so that Gyarados can get to the bench to be Seeker’d up. Why 3 Gyarados and not 4? Ever since Rescue Energy came out, 3 has been the universally accepted play, due to the fact that Rescue Energy, the deck’s main form of recovery, gets back both your Magikarp and your Gyarados, so you don’t need that many Gyarados. Of course, it’s nice to have some for back-up, in case you can’t get a Rescue Energy on Gyarados before it gets KO’d. In that case, Pokemon Rescue or Combee will get back your Magikarp, and then another Gyarados can be used to evolve into. 3 Sableye SF – Sableye is an incredibly useful card to assist set-up and is played solely for its Impersonate attack. Opening with a Sableye allows you to use a Pokemon Collector Turn 1 to get Magikarps, Regice, Unown Q, Uxie or anything else you may immediately need. The fact that you are forced to go first if you open with it is arguably a detriment, as it increases your opponent’s chances of getting a first turn KO, which, even if they don’t bench you out and “donk” you, is still a bad thing as it allows them to take an early prize. However, a good example of how going first can be a good thing is against an SP deck such as Luxray/Garchomp. Most SP decks can only realistically get KO’s on Turn 2, the earliest turn they can level up their SP basics. With Sableye’s 60 HP, colorless resistance and the fact that if you open with it you are going first, it is incredibly unlikely for a Luxchomp deck to get a first turn KO, which means if your set up is strong enough, you can possibly get the first prize on Turn 2, or if your set-up is slightly weaker, on Turn 3, meaning the opposing player will only get 0-1 early prize cards respectively, which is important in such a close match-up. 4 Sableye could be played to maximize your odds of opening with it, and that is of course an option. Remember, this list is just a sample list and all of your card counts can be played around with a lot – Gyarados is a very malleable deck. 1 Smeargle UD – Smeargle is used for its Poke-Power Portrait, which basically lets you use a Supporter in your opponent’s hand. This obviously helps with set up, both early-game and later on. Generally this card will have an Unown Q attached to it, allowing you to promote it after a KO, or a Warp Energy (often followed by a Seeker) and get a use of its Power, then retreat to Gyarados to attack. Another overlooked usage of this card to see what’s in your opponent’s hand. This can influence your decisions in-game, especially when to use Mesprit’s Psychic Bind or not. A large proportion of Gyarados lists run a higher Smeargle count over Sableye (such as 3 Smeargle/1 Sableye or 4 Smeargle/1 Sableye). The reasoning is that if you Portrait your opponent’s Pokemon Collector, some Gyarados builds can absolutely “go off” and even hit for 90/110 damage Turn 1. Of course, these builds almost always run 1 Sableye as well, so even if you can’t “go off”, you can still Impersonate that turn, as well as your Portrait. So why play more Sableye than Smeargle? It is definitely a preference thing, but I prefer the slightly slower, more consistent and reliable high Sableye count, but others prefer the high-risk, high-reward Smeargle. It also depends on what your list looks like: if it’s designed for maximum speed and consistency, then a higher Smeargle count is probably a better option. Another thing to consider is the odds of Portraiting a good supporter on Turn 1. Most decks run 3-4 Pokemon Collector, undoubtedly the best Supporter you can use Portrait on early game. Off an average of 6-7 cards, your odds of Portraiting it turn 1 are approximately 30-40% respectively. Every other time, you’ll usually be playing a Supporter that’s less helpful. Remember though, every list varies and there’s really no right or wrong as to what you play. 2 Uxie LA – Uxie is a card used in virtually every deck, and for good reason. Its Set-Up Poke-Power allows decks to be fast and to draw into crucial cards, and Gyarados is no exception. Some lists even run 3, but generally 2 is the best count due to bench space constraints. Psychic Restore can be a good attack in some situations, such as bypassing Gengar’s Fainting Spell attack, but it generally won’t be used too much. Uxie’s power can be re-used with SSU and Seeker if necessary, which is a very nice bonus. 1 Azelf LA – Gyarados is a deck that absolutely needs this, simply for the fact that the deck cannot afford to have any Magikarps sitting in the prizes, in order to achieve Tail Revenge’s full damage output. One thing people need to be aware of before using Azelf is not to give away to your opponent that something important is prized. Example: You open Sableye, go first and Impersonate, only to find that 2 of your Magikarps are prized. You explicitly complain that several Magikarps are prized and Impersonate. Your opponent then drops a Mesprit on you and prevents you from using Time Walk, severely limiting your ability to do anything. It sounds like an extreme example, but I have seen and heard of plenty of players giving away too much information of their prize cards which then subsequently gets punished. Power Spray is also another application of this point. If you have a Magikarp prized, don’t tell them, then Azelf, realizing they “know” (unless we’re going to get into a whole bluffing situation, but let’s just assume they know you’re trustworthy) you prized a Magikarp, subsequently get Sprayed. If your prizes are terrible enough to warrant multiple uses of Time Walk, Azelf can be re-used by SSU and Seeker. Just remember: don’t make it obvious to your opponent about your situation. That’s not to say Azelf is just for Magikarp though, as Time Walk can allow you access to any of the one-of cards Gyarados decks play, like Regice, Combee and Unown Q, or even cards you have multiple of like Uxie and Gyarados. Another use for Azelf is to map out your prizes. This is especially valid now that notes are allowed to be taken on which of your prize cards are where. The difference between nabbing an excess BTS and a clutch SSU out of your prizes can change the game, so don’t waste your opportunity to make sure you know which prizes of where, regardless of your method (just remember, be sure to do it in a timely manner!). 1 Mesprit LA – This is an interesting tech card that is played in most Gyarados builds for a variety of reasons. Psychic Bind is a very potent power, and can be incredibly disruptive when timed right. It can slow down the opponent’s set up early-game by preventing Set Up, Time Walk, QUICK, Portrait etc. but it can also prevent important Poke-powers mid-game like Flash Bite, preventing OHKO’s on Gyarados, so Gyarados can subsequently be healed. This strategy is especially important in the Luxchomp match-up, making an Expert Belted Gyarados unable to be OHKO’d by Luxray GL Lv X, even with Trash Bolt and Lucario GL. Mesprit plays an important role in Gyarados’s Luxchomp match-up, as well as being a great disruptive card early on in the game, and is re-usable through SSU and Seeker. 1 Combee SF –Combee’s use lies in its Ability “Honey”, allowing you to recover your 4th Magikarp from the discard and follow up with an evolution to Gyarados. It recovers Magikarp in spite of trainer-prevention (mainly Vileplume Undaunted, and also works as an easily searchable way of recovering Magikarp. 1 Regice LA – Mainly a card used for discarding Magikarps, Regice can be Collector’d for, discarding two Magikarps at a time. This allows Gyarados to have a speedy set up in case you can’t draw into a Junk Arm, or to be used in conjunction with Junk Arm to discard 3 Magikarps in one turn. Regice also has other uses, such as switching out a Spiritomb, or disrupt setups. Regice can also discard useless trainer cards from your hand against Vileplume decks, especially to limit the damage output of attacks like Gengar’s Poltergeist. It has a very large retreat cost, which means that it can be dragged up in certain match-ups (Luxray GL LV.X Bright Look, Blaziken FB Luring Flame, Froslass GL, etc). Warp Energy and Warp Point are ways to get Regice out of the active spot so it’s not stuck there while your opponent snipes around it. 1 Unown Q MD –QUICK allows you to freely retreat Smeargles, Sableyes and many other basics in your deck. Unown Q does have a downside though: its 30 HP, which can lead to it being donked even if your opponent goes first ( Uxie + energy or a Luxray GL/Garchomp C + DCE). But despite this, Unown Q generally helps the flexibility and speed of the deck in general by not having to waste an energy attachment (An issue, since most Gyarados builds play six or less). 2 Crobat G PL –The ability to get 10, 20, 30 or even more damage from nowhere with Crobat G’s “Flash Bite”/Poke Turn/SSU/Seeker is incredible, and leads to unexpected OHKO’s. Unlike a lot of other “tech” cards played in Gyarados, Crobat G isn’t even a bad starter, thanks to its free Retreat and 80 HP. Flash Bite can even be used to get around effects and Poke-Powers like Rescue Energy and Fainting Spell. Overall, Crobat G is a very strong addition to Gyarados decks. 4 Pokemon Collector – Pokemon Collector is vital to the speed and consistency of Gyarados: letting you grab any 3 basic Pokemon allows the deck to get all the Magikarp it needs for immediate discard with other cards. It is also useful mid-to-late game as well, grabbing basics you might need like Crobat G, Mesprit, Combee and so forth (not to say those cards can’t be used early-game too). 4 is the universally “correct” number because you always want to have it in your opening hand. Pokemon Collector, being a Supporter obviously, can be used with Impersonate. 4 Junk Arm – Junk Arm lets you discard any two cards (most likely Magikarps) immediately, without even having to use a Supporter, while letting you re-use any of the trainers in your deck, such as SSU, Poke Drawer + and Pokemon Rescue, etc. Unfortunately, it’s necessary to have a Trainer card in the discard pile to use Junk Arm, but with the high amount of Trainers played, it’s not such a big issue. 4 Broken Time-Space – Broken Time-Space (“BTS”) allows you to immediately evolve Magikarp straight to Gyarados. For early-game speed, healing, and recovery, four are in this build because it’s essential to have, even if that 1 BTS will last the rest of the game (which it will against most match-ups). Some lists can get away with 3, especially with the Poke Drawer +, but it can be a bit of a risk. 2 Luxury Ball – Luxury Ball is usually a one-of in most decks, but 2 are run here because the excess copy can be discarded. Luxury Ball is almost always better than Pokemon Communication, but 2 is probably the max that would be considered, due to the fact it can’t be used if one is already in your discard pile. 1 Pokemon Communication – This card acts as a sort of “3rd search” Trainer, but since you can use it whenever, it takes the spot of the 3rd Luxury Ball. Shuffling in useless Pokemon can be useful though, to get more cards from Uxie’s Set Up. 1 Bebe’s Search – If Luxury Ball and Pokemon Communication do basically the same thing as Bebe’s Search while being trainers, then why run Bebe’s Search at all? Basically, it helps with trainer lock, but still helps the deck’s overall consistency somewhat and can be Impersonated regardless of the situation. Some lists run 2, in case your 1 Bebe’s is prized or if you opponent plays a Lookers/Judge once you Impersonate, but due to space constraints, only 1 is run here. 1 Copycat – This card will probably be sticking out like a sore thumb to most readers, but it’s a solid draw supporter, and 1 or 2 draw supporters is never a bad idea in Gyarados. Why having a draw supporter is good: Any draw supporter you run 1-2 (or even more) of can be Impersonated with Sableye should you have a bad hand. They can also be re-used with VS Seeker, which can in turn be re-used by Junk Arm. More than that, though, draw supporters can allow you to draw into cards that you couldn’t otherwise get. It also takes some “pressure” off SSU and Seeker, so you don’t have to “waste” them re-using Uxie’s Set Up and can use them for other Poke-Powers. That said though, many Gyarados lists run fine without any draw supporters, but they can be a nice inclusion. Again, like all deck choices, what draw supporter(s) you play, should you play any, come down to preference and metagame. 4 Poke Drawer + – Poke Drawer + is a card that helps consistency, especially midgame, by being able to search out any 2 cards in your deck if you have two copies of it in your hand. This is especially good at getting otherwise unsearchable cards like Rescue Energy, Seeker etc. and has great synergy with Junk Arm. It can also be played one at a time to draw 1 card, which can be OK if you’ve got a bad hand to get you a shot at drawing into something decent or to draw into a certain card you really need, but the main reason you’ll ever want to play only 1 at a time is if you need a trainer card in the discard pile to allow Junk Arm to be played. Most times you’ll want to save a copy in case you get a 2nd. Poke Drawer + is an overall great trainer, but another less obvious effect of playing it is that it allows the Gyarados player to cut back on certain cards they run. Example: While some lists might run 3 Expert Belt to help draw into it, if you run 4 Poke Drawer, you can easily get away with 2. Poke Drawer also works well with 1-of cards in general. In this list – VS Seeker, Pokemon Rescue and Poke Turn especially. 4 Super Scoop Up (“SSU”) – its main use is for scooping up a damaged Gyarados, but it can be used to re-use Uxie, Azelf, Crobat G, or any other coming-into-play Poke-Power (or Item, like Combee’s Honey). SSU can be Junk Arm’d and is very good with Mesprit, especially when you’re trying to use it enough times to get past Power Spray. 3 Seeker – In a similar vein to SSU, Seeker is useful in picking up your damaged Gyarados/ reactivate coming-into-play powers. Unlike SSU, it only works on your benched Pokemon, lets your opponent pick up a benched Pokemon , and is a Supporter card; but the fact Seeker doesn’t make you have to flip makes it a very strong card. The Warp Energy (or Warp Point)/Seeker combo is a surefire way of healing your Gyarados. Seeker counts vary between Gyarados lists, and with VS Seeker, I feel that 3 is a good number, but it really depends on the rest of your decklist, your metagame and your personal preferences so there really isn’t a “wrong” Seeker count. 2 Expert Belt – Expert Belt is a great card which has synergy with the high amount of cards that can scoop a damaged Gyarados back up. Play it down on your Gyarados to increase its damage output and increase its HP, then when it gets damaged, just Warp/Seeker or SSU. Once you run out of healing cards, you don’t have to play it down on Gyarados again so you don’t have to risk the extra prize card when Gyarados gets KO’d. 2 Expert Belt is almost certainly the right amount in any Gyarados that runs Poke Drawer + or even Twins. In 99% of games, 2 Expert Belts is all you’ll need, and considering it can be Junk Arm’d as well, in most lists 2 is the correct amount. 1 Poke Turn – Poke Turn is an interesting card for Gyarados lists. When Triumphant came out, most lists were playing 3-4, but as City Championships progressed, more and more people started cutting their Poke Turn counts and some even getting rid of them altogether for other cards that they considered better. Poke Turn is, predictably, for re-using Crobat G’s Poke-Power Flash Bite or for just scooping up Crobat G to play something else in its spot, or even to remove damage from a Crobat G by scooping it up. But just how useful is that extra 10 damage? That’s up for the player making the list to decide. So why 1 Poke Turn in this list? The idea is that it can be searched out with Poke Drawer + and re-used with Junk Arm so it’s a nice 1-of card in this deck. While I didn’t feel it was useful enough to justify 3-4 slots in this particular build, it can be occasionally very useful. 1 Warp Point – Warp Point falls into a similar category as Poke Turn, being a nice 1-of trainer card which can be searched out with Poke Drawer + and also be Junk Arm’d. Warp Point is a useful card in its own right, while acting as a switch card (good for getting Gyarados to the bench to Seeker, getting Sableye out of the active spot, getting Regice out of the active spot etc.) while also being able to take cheap prizes. It can be disruptive early on in the game if your opponent hasn’t got a Pokemon to send up to “sacrifice” and sometimes Warp Points can net you disruptive KO’s on Pokemon your opponent didn’t want to lose, but a lot of times when you play this card it’s just going to get you an easy prize, which is a good thing. 1 VS Seeker – VS Seeker can act as another of any one of your supporters (once they’ve been played) and can also be Junk Arm’d. It’s not impossible to use 5-6 Seekers a game because of this and it generally allows flexibility. 2 is a nice play, but only 1 is played here due to space constraints. 1 Pokemon Rescue – Yet another 1-of Junk Arm-able trainer card, Pokemon Rescue performs a different role to the others in this deck. It is used for getting back Magikarp once your Gyarados gets KO’d. One could argue that a 4th Rescue Energy does the same thing but better, but in some situations Pokemon Rescue is superior (if they have bypassed Rescue Energy’s effect in some way, or if they were able to KO Gyarados before you could draw into a Rescue Energy – Pokemon Rescue can be used after your Gyarados is KO’d) and it can also be re-used with Junk Arm, hence the 3-1 Rescue Energy/Pokemon Rescue split in this particular build. 3 Warp Energy – Warp Energy is a card primarily used to get Gyarados back to the bench to Seeker up, but can also be used to get cards like Sableye, Smeargle and Regice out of the active spot. Only 3 are run due to space constraints and because once you get the Warp Energy/Seeker combo, you can just re-use the same Warp Energy over and over again. 3 Rescue Energy – Used to recover both Magikarp and Gyarados when KO’d. If Gyarados is KO’d with anything other than damage, Gyarados will be discarded, so watch out. Usually, the only ways the opponent can do that is through Flash Bites, which means they aren’t OHKO’ing so you can often scoop Gyarados up, but it can happen. It doesn’t have to be used on just Gyarados though. In some match-ups you might even want to attach it to your Regice. It can even be used for retreating if necessary, although not desirable. Here at HeyTrainer, if we post something that holds a relatively high probability of being less than stellar, shaky, or just outright trash, we feel it's our obligation to inform you of this. Hence, we're quick to warn you on MANY things, including those aforementioned in yesterday's Palkia article. Today, however, you should be afraid…Very afraid. Warning: this deck list is not just rogue…It's super rogue. Warning: this deck list is largely untested, and was made mainly just to challenge the notion that it's impossible to build the deck. Warp/Seeker works really nice when the subject of your deck is a 180 HP behemoth. For added fun, if you feel your consistency isn't that bad, consider running Super Scoop Ups, too! WARNING: THE BELOW LIST IS UNTESTED, AND MIGHT BE BEYOND HORRIBLE IN A REAL GAME! WARNING: PALKIA LOCK IS A PROVEN ARCHETYPE FROM THE PAST, BUT MAY BE HORRIBLE FOR STATES, EVEN IF THE LUCARIO VARIANT IS SUPER-GOOD! WARNING: THE BELOW LIST IS CRAZY-AWESOME! The idea is pretty simple: use Mesprit's Psychic Bind to repeatedly assure a power lock for the whole game by means of Super Scoop Up and Seeker. The list could definitely use some hand disruption to make things extra cooler: Giratina PL, Judge, and/or Looker's Investigation are all awesome choices. This is definitely atypical for SP, and – as qualified – could very well be terrible beyond belief. However, it's pretty easy to make tweaks to make this a more standard SP. It may take some work to do it, but you can feasibly fit 3-1 garchomp, 4 Double Colorless Energy, and an Ambipom G and/or Dragonite FB to make things work. Also, to accommodate for your presumably horrid Lostgar (Gengar Prime Triumphant/Lost World Call of Legends) matchup, you might consider running Absol G LV.X, Chatot G, and a Lost World or three of your own.